Every kid can recite the little chant to the Ladybug. "Ladybug, Ladybug fly away home your house is on fire and your children all alone." I have often wondered how that little verse came about and if it had some other meaning so I checked it out and Wikipedia sheds only a little light on the topic but is definitely worth checking out. 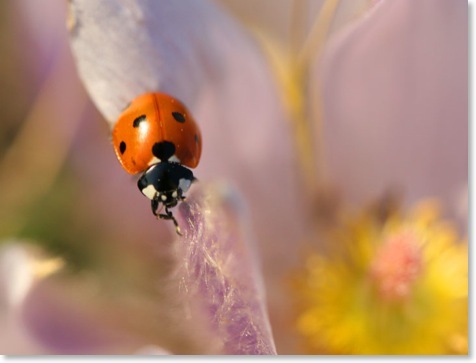 But this little bug with its positive affects on the environment and the superstition of bringing good luck is one of the gems in our ecological culture. Regina photographer Ken Jones goes out to the Qu Appelle Valley each year to photograph the spring crocus and this year which he was carrying out the task of capturing the marvels of the crocuses he was distracted by a persistent Ladybug who was determined to investigate all that there is to know about the crocus blooms. These pictures seen on the next page capture this little creature and are quite remarkable when you consider that these were hand held images and the focal focus length is not quite half an inch.